1. QuickBooks credit card processing Interchange fees are way through the roof! 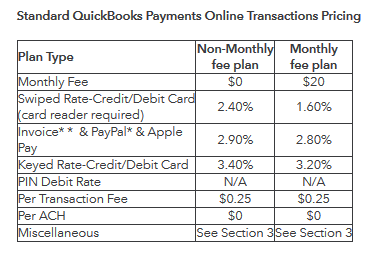 3.4% interchange fee(QuickBooks credit card processing fee )for keyed in credit card numbers are more than the maximum interchange fee listed by VISA.In the US for B2B payments this can be reduced to up to 1.65% if level 2-3 data is being sent for VISA which is usually enabled on most advanced payment processing software. 2. QuickBooks ach payments take 5 days to settle which is too long a time for the bank to bank transfer. Quick books seem to not support the new same-day ACH payment feature.With the new same-day ach payment feature, you can receive payments using the bank to bank transactions in your account in a day. The problem with 5 days to settlement is that not just you will be always receiving your payments 5 days late.Cases wherein payments are rejected due to insufficient funds in your customer’s bank, Wrong account number or routing information of your customer’s bank will be known to you after 5 days. After which you will have to redo the transaction and will result in another 5 days for you to receive payments. After invoicing your customer your team might need to at time do multiple follow-ups to get paid on time. If your business has more than 20 customers it is important for you to start automating the customer communication based on customer segmentation and invoice segmentation so that your team has more time to follow up with delinquent or high-risk customers.This is why collections management software integrated with your payment processing software is a must-have. In short, it makes sense to use QuickBooks credit card processing or QuickBooks ACH processing if you are using the product during the initial stages of your business.For a matured business with more than 20 paying customers and an annual revenue greater than 100 k USD, Quickbook payment processing feature may not be the right fit for you.